Blogiversary: Time Management Tips and a Newsletter! I published my first blog post 2 years ago. It's hard to believe it has been so long! I have published 295 blog posts: 104 Mommy Monday posts, 105 Teacher Tuesday posts, and a few others thrown in for good measure. I started my blog as a way to keep myself occupied with something creative and productive when my daughters started having overnight visits with their dad, and now, two years later, I absolutely love it and have no plans of stopping. Today I wanted to celebrate this milestone in two ways: by sharing some of my top time management tips for how I "get it all done", and by launching a new and improved way to stay in touch with my newsletter! No party would be complete without friends, so I've got my best blogging buddy Jennifer from The Yellow Brick Road sharing her tips and launching her own newsletter as well! Stay tuned to the end of the post to learn more about the newsletter launch and see Jennifer's post. But first, let's talk time management! The #1 reason I am able to add blogging to the long list of other responsibilities I have in my life is because I love doing it. It gives me a creative outlet, and allows me to reflect on my successes and efforts in all different parts of my life. Being and single parent and an elementary music teacher are both pretty isolating positions- in both cases I am mostly my own team. Having a way to share my thoughts and ideas is so helpful for keeping me motivated at home and at school. And hearing from other people in similar situations, whether through blog comments, emails, or on social media, helps me remember that I'm not alone. Whatever recurring task you are trying to add to your life, it's important to find a motivator whenever you can. If you aren't motivated to do something, you probably will find a way to not do it! Like my motivation to clean my house- can somebody help me out with that one please? 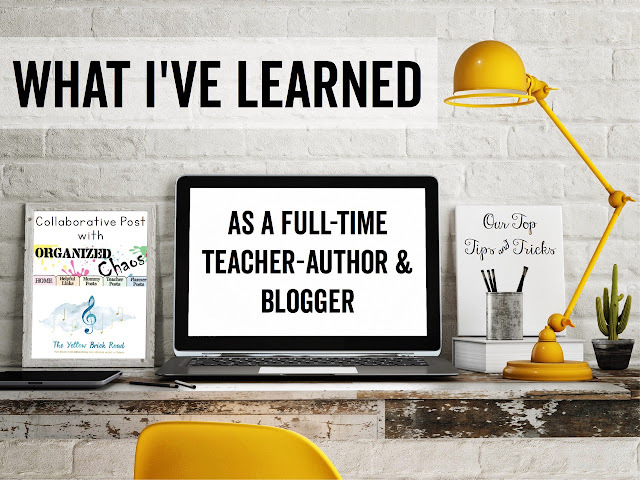 One of the best things I ever did for myself when I started blogging was to commit to a weekly schedule of blog posts (my "Mommy Mondays" for home/parenting posts and "Teacher Tuesdays" for music education posts). I work best this way with anything I am trying to add to my tasks- when I realized I was having trouble remembering to clean the toilets, I made a weekly cleaning schedule and assigned a couple of small tasks to each day. Whatever it is that I'm trying to get done, I always do best when I figure out a schedule that is reasonable and try to stick to it. Whatever it is that you're trying to get done, figure out the schedule that works best- for monthly tasks it might be the first Saturday of each month, for weekly tasks it might be every Tuesday- and commit to it! By publically declaring my schedule on my blog and committing to a Mommy Monday and Teacher Tuesday post each week, I made myself accountable to actually following through- it would be a lot less embarrassing to miss a post if I never said when and how often I was going to write. Whatever schedule you decide to set for your tasks, tell others about your plans to help hold yourself accountable. Write your schedule down and post it on the fridge, write about your plans on social media, or just tell your family what your new schedule will be and ask them to follow up with you. This may seem a lot like the first one but it's different, I promise. Once I set a schedule for when I was going to have certain posts written by- my deadlines- I needed to find time to actually write the posts- my rhythm. There are a lot of different styles amongst bloggers on this one: some sit down, write a post, and publish it immediately, others work on posts in small increments here and there and publish when they're done. I have found my best routine is to write my posts in one sitting, for the most part, but write them enough in advance to give myself time to edit and generally ponder before I publish. My general "rhythm" for blogging is to write my two main posts on the weekend, and set up any other posts (like the Fermata Fridays linky I've been doing this past year) during the week. During the week I also share my blog posts on social media. I've found this is a manageable routine for me. With any recurring task I need to add to my life, it's important for me to find a manageable way to get it done. Monday/Wednesday/Friday: wake up early to work on social media posts for the day, get the girls ready for school, teach, pick the girls up from school, cook dinner, hang out for a bit, go to bed. Tuesday/Thursday: same, but the girls go visit their dad after school so I run errands after school. I also schedule any appointments and staff meetings on those afternoon/evenings. pick up the girls after dinner and go straight to bed. Sunday: most of my morning is spent at church, then meal planning and grocery shopping in the afternoon, finish any blog posts that aren't done for the following week. I hope you found these tips helpful, whether you're interested in my thoughts on blogging or just time management in general. I've always been hesitant to talk about my life as a blogger on my blog- it feels a bit like explaining how a hotdog is made to someone eating a hot dog (not that my blog is unhealthy for you.... you know what I mean)! If you'd like to hear more about my bloggy self, whether that means practical tips, advice, or general musings and reflections, please let me know in the comments. *A monthly newsletter sent to your inbox that includes some general musings on life, highlights a few blog and social media posts from the past month, and shares some timely resources from my shop. *An exclusive free file every month (with each newsletter) with a basic outline of the lessons I will be teaching in my K-6th grade general music classes. *Alerts of any major news, sales, and promotions (I usually have about 6 in a year- these will mostly be included in the monthly newsletter or sent separately so you don't miss anything!). Signing up is easy. Once you enter your email address below, you will be prompted to confirm your email address. Make sure to confirm your email address so that you're added to the mailing list! You may want to check your junk mail folder (or your "promotions" inbox in gmail) if you don't receive my newsletter. The first one will be sent out on July 23, and you should receive one each month after that. If it doesn't go to your regular inbox, you may want to adjust your email settings so that you don't miss future mailings! I hope you enjoy reading and connecting on a more personal level, and I hope you'll interact with me as well- I really do enjoy hearing from you! You'll find all of my contact information in the newsletter (and you can find that information at the top of the blog as well). Don't forget to go check out Jennifer's post too- she is also sharing her time management tips as a full-time blogger / teacher author and she's launching her newsletter today too, which I know you'll want to sign up for as well! Great post! And congrats on a 2 year milestone! As a blogger myself, I have been reading lots of different blogs and posts with bloggers writing about their journey building a blog. It has been so incredibly helpful! Thank you for sharing. As of "make your commitments known" - great tip, one I have been going back and forth with. I have been wanting to do a post about it and I keep postponing it. Maybe now I will do it.